The 2017 Subaru Legacy in Kansas City is an excellent choice for drivers who need a car to tackle winter driving. It's one of a few cars in its segment to come standard with all-wheel drive, and it delivers great outward visibility allowing drivers to clearly see the road ahead. In addition to these perks, the Legacy is fitted with a number of outstanding safety technologies and has received top crash safety scores for its capabilities. Read our 2017 Subaru Legacy review below for more info about the model and its latest updates. The five-passenger Subaru Legacy is available in several trim levels: 2.5i, 2.5i Premium, 2.5i Sport, 2.5i Limited and 3.6R Limited. 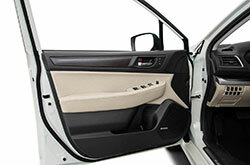 Of the five models, the Sport trim is the newest edition to the lineup and comes with great features. On the 2.5i Sport, you'll find 18-inch wheels, a sunroof, keyless ignition/entry, an auto-dimming rearview mirror and foglights. A number of sporty exterior elements are also included on the Sport, enhancing the overall look of the vehicle. 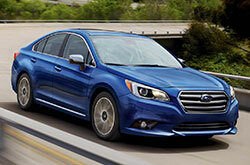 Other features outfitted on models throughout the Legacy lineup include automatic headlights, Bluetooth, dual-zone automatic climate control, a 12-speaker sound system, navigation, satellite radio and leather upholstery. All versions of the 2017 Subaru Legacy in Kansas City come with either a 2.5i four-cylinder or 3.6R six-cylinder engine. The former delivers 175 horsepower and 174 lb.-ft. of torque, while latter produces 256 horsepower and 247 lb.-ft. of torque. Both powerplants are mated to a continuously variable transmission. Of the two engines, the four-cylinder offers the best fuel economy. It produces an EPA-estimated 29 mpg combined, 25 city and 34 highway. Standard amenities included on the Legacy are traction control, stability control, antilock brakes, a rearview camera and airbags. 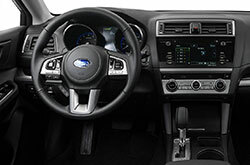 Other available technologies noted in 2017 Subaru Legacy reviews include forward collision warning, pedestrian detection, lane departure warning, automatic intervention, automatic braking and reverse automatic braking. If you're shopping for the 2017 Chevrolet Malibu, Ford Fusion and the Honda Accord in the Kansas City area, you should also take the 2017 Subaru Legacy into consideration. You're likely to find it complements your needs, with its rakish design, premium on-board technologies and welcoming personality. 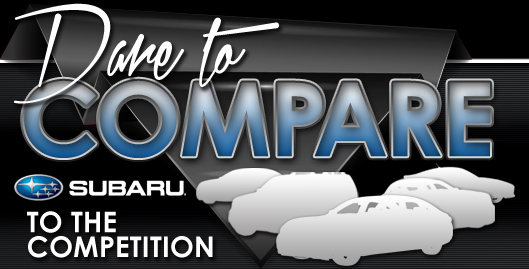 Confirm if it's ideal for you using our 2017 Subaru Legacy report as well as the included comparison tool; and afterward, make sure you view great lease incentives on our website. 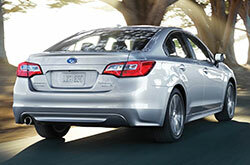 Among our huge assortment of cars, the Subaru Legacy is a sought-after option at our Subaru dealership. We've included this 2017 Subaru Legacy review on our site to make it less time consuming for you to find the specifications you need to make an intelligent vehicle purchase. 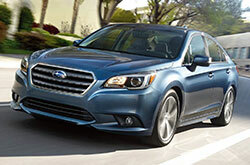 Get all set to be amazed with the gorgeous Subaru Legacy for sale in Kansas City, MO. Schedule an appointment for a test drive. Can't wait to see its modern features at our dealership? Look at our video now!